Whether you’re lying in a candle-lit bed of immaculately arranged roses on the most romantic night of your life or receiving a single, limp Walmart carnation from your awkward work colleague this Valentine’s Day; have you ever wondered where these flowers come from? Well, the chances are very good that your special gift arose (ahem) from Colombia. The South American nation sends over a billion dollars’ worth of roses, carnations and mums to the US every year. Since the 80’s, Colombia has been the largest supplier of cut flowers for the US, accounting for over 75% of all flower imports. In an ideal world, Colombia’s reputation in the U.S would be more blossoms than drugs. The U.S affinity for Colombian flowers has the most humble and curious of beginnings. It started with a man named Mark Cheever, who wrote a paper in 1967 while at Colorado State University. If Mark was anything like myself, there’s a decent chance this was written with a hangover and almost certainly turned in late, but this little paper became the genesis for the now billion dollar flower industry. Cheever’s paper identified Bogota’s savannah region as the perfect place to grow and export flowers to the U.S. The clay-rich soil and matrix of wetlands covering the Andean plain stand 8,700 feet above sea level, just 300 miles north of the equator and within close proximity to the Pacific Ocean and Caribbean Sea. These conditions create a temperate year-round climate, with consistent exposure to 12 hours of light and little temperature variation. Furthermore, Bogota is just a three hour flight from Miami; even closer to East Coast customers than the U.S.’s top flower producer California. Cheever entered the Colombian flower market a few years later, not wanting to sit back and watch his ideas exploited by others, and soon thereafter Colombia boomed into becoming the world’s second largest flower exporter behind the Netherlands. The relatively cheap cost of labor in Colombia combined with ample U.S. aid continued to fuel the market over the following decades. Today, the Colombian flower industry directly employs over 90,000 Colombians with another 40,000 employed indirectly along the supply chain. The industry is a crucial employer of low-skill, largely female labor often taken from low-income areas surrounding Bogota and Medellin. Bogota’s savannah now accounts for close to 75% of all Colombian flower production, with Medellin’s Rionegro valley taking up close to 24% and the remainder scattered throughout the country.Nowadays, over thirty flower-filled Colombian planes stream into Miami each and every night, often returning empty the following morning. These numbers are significantly amplified leading up to Valentine's and Mother’s Day. Flowers are now the most important cargo item at the three major international airports in the supply chain; Miami, Bogota and Medellin. Approximately 150 companies, mostly located in the Miami area, currently import and distribute Colombian flowers in the U.S. 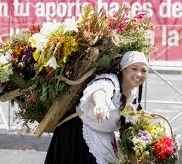 Flowers have played an important part in Colombian life even before the industry’s boom. Medellin’s Flower Festival is over 50 years old and has turned into one of the most vibrant, joyful and important social dates on Colombia’s calendar. Held every August, the festival is the ideal excuse to head down to Colombia and experience the Colombian rumba’s famous parades, dancing, drinking and smorgasbord of cultural activities.The industry is not without controversy however. The American flower industry bemoan their reduced competitiveness due to lower labor costs and the environmental impact of flying the flowers overseas. On the other hand, the treatment of local employees and the industry’s use of various pesticides and chemicals that are banned in the U.S has also attracted scrutiny. Regardless of these issues, the Colombian flower industry essentially embodies a free market; the development and success of a new producer based on its ability to supply a good in demand in the most cost efficient, profit-maximizing manner. There is no doubt that Colombia’s flower industry has established a spectacularly successful relationship of mutual benefit with the U.S. Colombian flowers have helped create infinite moments of joy and gratitude, from the romance of receiving your first middle school rose to the humble gratefulness of buying a bouquet for your mother. Valentine’s Day is the perfect excuse to cherish and spoil the one person who matters most in your life. There is no better way to remind someone of all the little things that make you love them than with a bouquet of beautiful, alluring flowers – all the way from Colombia.